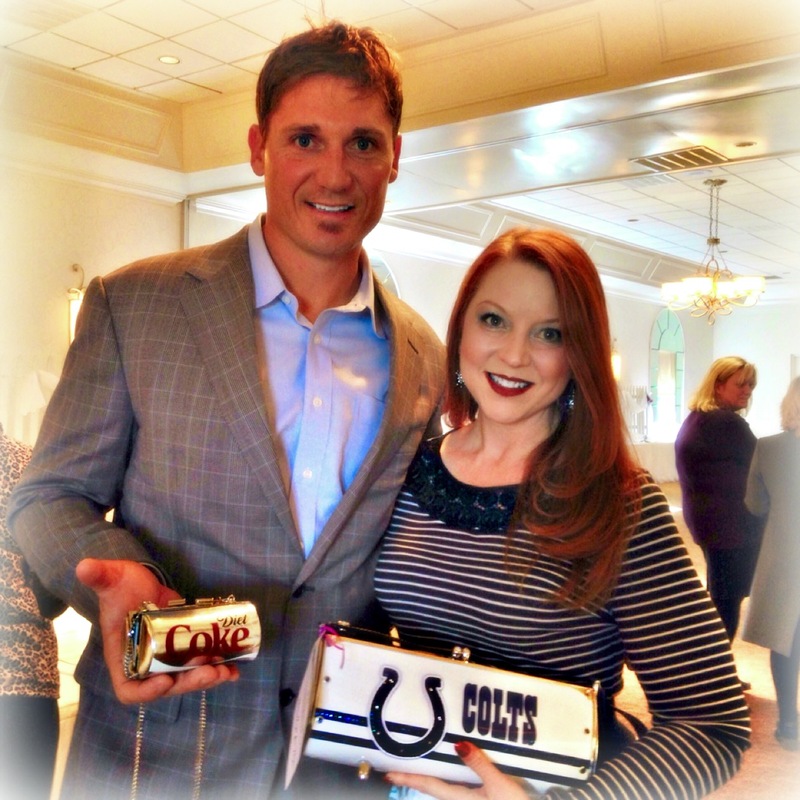 Retired Indianapolis Colt and superbowl champ Justin Snow and I compare our auction wins: he was the high bidder on my Diet Coke clutch, while I went home (coincidentally) with a Colts clutch. 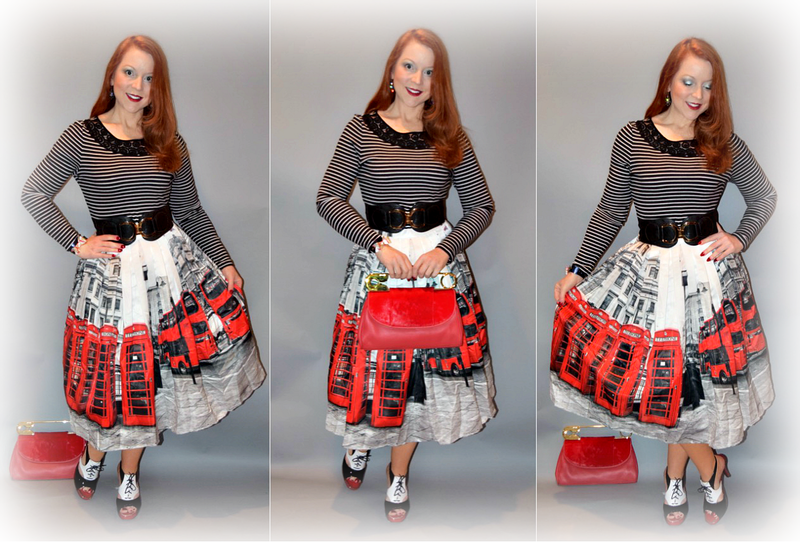 This insanely puffy, pleated Chicwish skirt featuring a London street scene is not for the timid, and was quite the conversation starter at Handbags for Hope. If you follow Red's Shoe Diaries, you know I'm addicted to Diet Coke. So, naturally, when I found a small silver clutch that mimicked my favorite caffeinated beverage can, I had to have it. I carried it for the first time on Saturday, to the 8th Annual "Handbags for Hope" fundraiser. This event features a live and silent auction that raises funds for the Beacon of Hope Center for Women, a local non-profit whose mission is to empower victims of domestic violence to become self-sufficient by providing safety, support and education. It was my first time at the PNC Bank-sponsored fete, and my introduction to Beacon of Hope and the valuable programs and services it provides to the central Indiana community. I sweetened the pot for the live auction of my Diet Coke clutch by throwing in my custom-made bracelet made from an "upcycled" Diet Coke can. 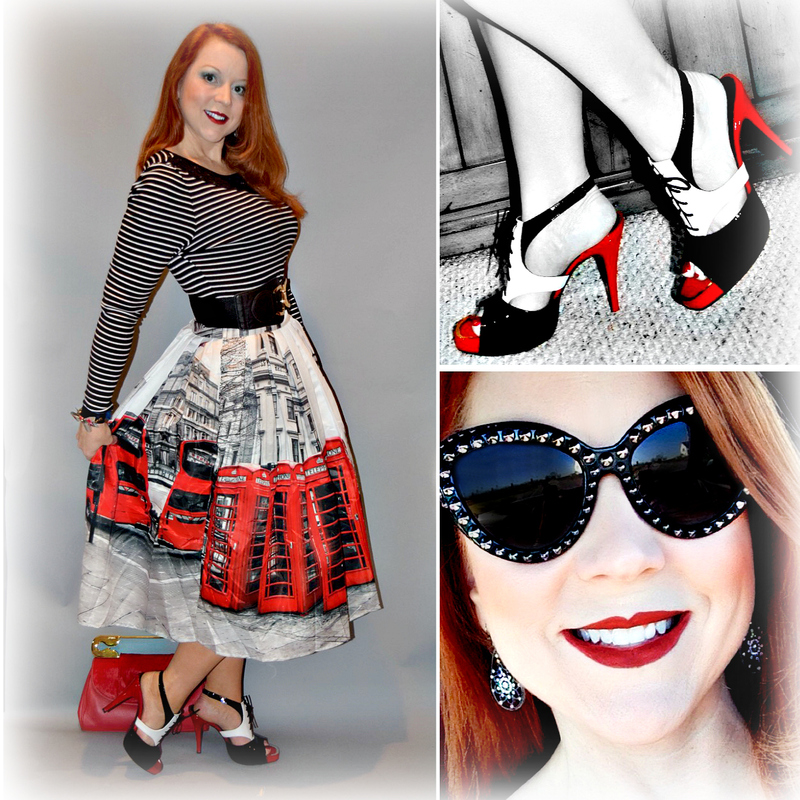 Find out more about this upcycled aluminum can jewelry here. A friend who knows well my penchant for unique purses invited me, and I have to admit I agreed to go as much for the unusual format of the event as for the cause. Each guest brings a new or lightly used handbag filled with "surprises." Some of the purses were put in a traditional silent auction (a popular staple of Indiana fundraisers), while others were reserved for the live auction that took place following a delightful meal. My initial contribution to the live auction was a large, special edition Vera Bradley tote bag filled with two smaller Vera Bradley pieces (a cosmetic bag and travel jewelry case); blown glass wine charms; a braided leather and silver bracelet, gift cards for Starbucks and iTunes, and a Bath & Body Works gift set. 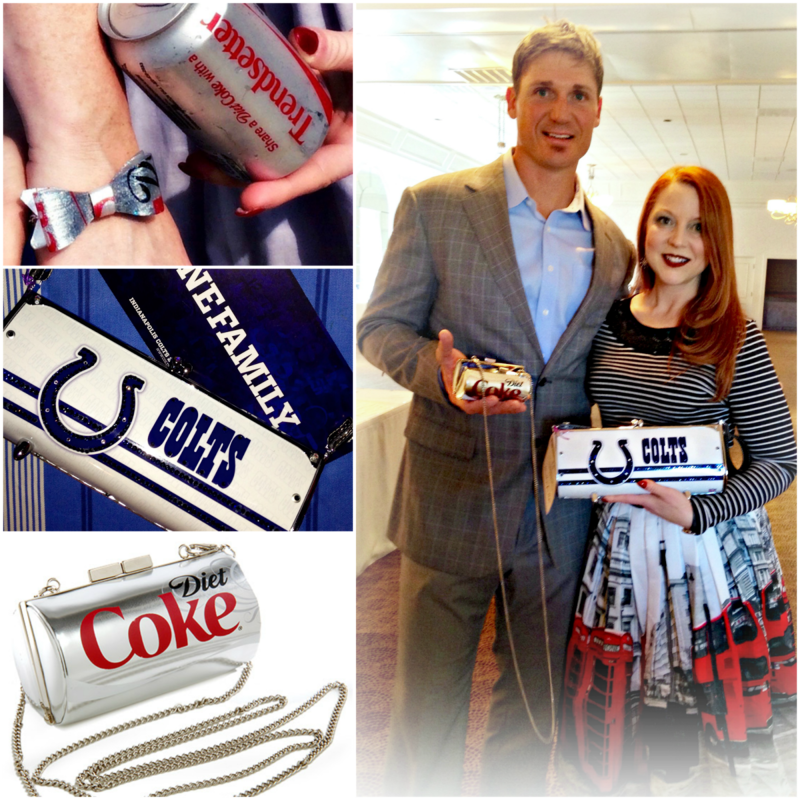 I hadn't planned to put my brand new and beloved Diet Coke clutch in the auction, as well. But, I was so moved by the program and the impact that Beacon of Hope makes on the lives of women who, but for the grace of God, could be me that I made a spur of the moment decision to offer up my shiny little piece of Diet Coke kitsch for the cause, too. As you might expect at a handbag-focused event, the guest list was overwhelmingly female. But several local news anchors, athletes and other philanthropic-minded men stepped up to "model" the purses, with emcee Chuck Lofton and volunteer Justin Snow also bidding handsomely during the live auction on items intended as gifts for loved ones. And that's how Justin ended up buying the bag off my arm. I told you it wasn't nearly as odd as it sounded! 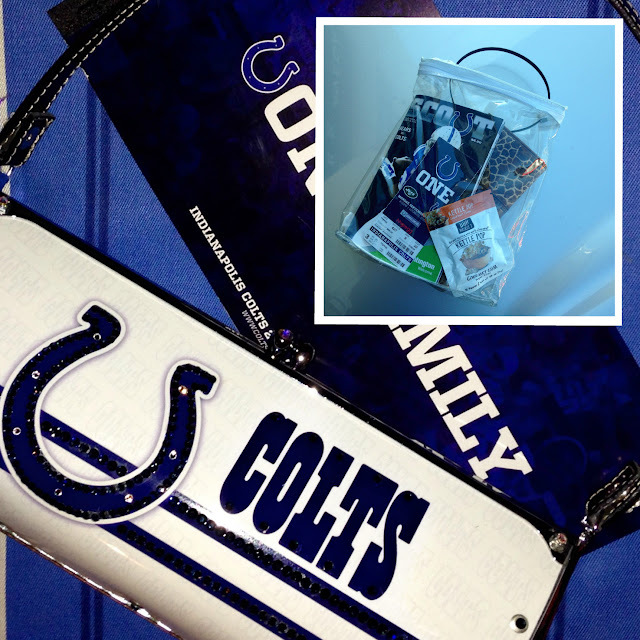 There's no denying the contrast between my new Colts clutch and the "purse" that I rigged up at the last minute to meet NFL stadium security requirements earlier in the Season (inset), though that bag definitely served its purpose (I blogged about it here). I haven't heard any final numbers yet, but by all accounts the event was a big success, and I was thrilled that my handbag contributions raised nearly $600 to help Beacon of Hope serve women and families in need. Not surprisingly, I didn't leave the auction empty-handed either. I came home with a super cute Indianapolis Colts-themed clutch. Although I'm still quite proud of the NFL stadium rule-friendly zip tie and a clear plastic curtain bag I MacGuyvered for this year's home games (remember my Black & Blue Monday post? ), there's no denying my new clutch is quite a bit more stylish (though it is, unfortunately, still a bit too big to pass muster with Lucas Oil Stadium security).